June has been such a fun month. It definitely felt like summer all month, so thank goodness for sprinklers and slip and slides. June also meant our summer vacation, a road trip to Dallas for a Texas Rangers game. I'll share more about our exploration of the city in an upcoming recap post. Here are a few favorites from the month of June. Favorite dinner - Skillet Chicken Suiza from Bev Cooks. This meal was a bit more labor-intensive than I prefer for summer dinners (meaning: I had to pull out the food processor), but the flavorful sauce was worth the effort. We eat a lot of Mexican-style dishes at our house, and I loved this one for something a bit different. Favorite breakfast - Banana Bread from Everyday Reading. Banana bread is always a classic and a crowd-pleaser, and we really liked this recipe. Favorite dessert - No Churn Chocolate Cookies and Cream Ice Cream from Bakerella. I have an ice cream maker attachment for my stand mixer, but it's kind of a pain to use, so I appreciate a good no-churn recipe. This one was so rich and chocolaty, and Jona enthusiastically helped me both make and eat it. Favorite podcast episode - The Lazy Genius Yard Sale. I don't think we're going to get around to having a garage sale this summer, but when we finally do I will be re-listening to this helpful, practical guide. Favorite book - An American Marriage by Tayari Jones. I waited a looooong time to get this one from my library, but it was worth the wait. Tayari Jones managed to pack so much into this compelling, couldn't-put-it-down novel that it kind of blew my mind. Favorite post on Shea Lennon - How to Dress Comfortably in the Summer. I can't seem to get enough of the dusty blue + blush pink color combination right now and this look is one of my favorite ways to wear it. Favorite new blog to follow - The Hungry Bookworm. I have been loving this new-to-me blog that brings together two of my favorite things in life: books and food. Favorite wardrobe addition - striped shorts from Loft. With highs reaching 100 degrees every day we were in Dallas, cute but comfortable shorts were a necessity for our trip. I love this pair and felt comfortable and still "me" in this pair I picked up earlier this month. See how I style them in this post. 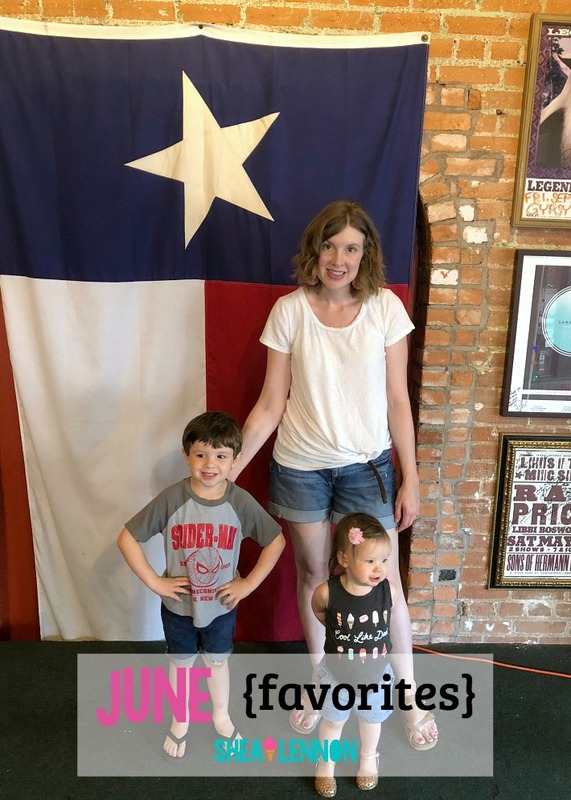 Favorite travel - our trip to Dallas! I'll be sure to share more in an upcoming recap post. Favorite kid date - evening storytime at the library. Our library offers an evening storytime once a week aimed at kids aged 3 to 5. I've been taking Jona whenever I can and he loves it. Plus it gives him a chance to pick out his own library books, which he loves to do.